This repository is a fork of SimpleMDE, made by Sparksuite. Go to the dedicated section for more information. In addition, the syntax is rendered while editing to clearly show the expected result. Headings are larger, emphasized words are italicized, links are underlined, etc. autoDownloadFontAwesome: If set to true, force downloads Font Awesome (used for icons). If set to false, prevents downloading. Defaults to undefined, which will intelligently check whether Font Awesome has already been included, then download accordingly. autofocus: If set to true, focuses the editor automatically. Defaults to false. autosave: Saves the text that’s being written and will load it back in the future. It will forget the text when the form it’s contained in is submitted. enabled: If set to true, saves the text automatically. Defaults to false. delay: Delay between saves, in milliseconds. Defaults to 10000 (10s). uniqueId: You must set a unique string identifier so that EasyMDE can autosave. Something that separates this from other instances of EasyMDE elsewhere on your website. blockStyles: Customize how certain buttons that style blocks of text behave. bold: Can be set to ** or __. Defaults to **. code: Can be set to ``` or ~~~. Defaults to ```. italic: Can be set to * or _. Defaults to *. element: The DOM element for the TextArea to use. Defaults to the first TextArea on the page. forceSync: If set to true, force text changes made in EasyMDE to be immediately stored in original text area. Defaults to false. hideIcons: An array of icon names to hide. Can be used to hide specific icons shown by default without completely customizing the toolbar. indentWithTabs: If set to false, indent using spaces instead of tabs. Defaults to true. initialValue: If set, will customize the initial value of the editor. insertTexts: Customize how certain buttons that insert text behave. Takes an array with two elements. The first element will be the text inserted before the cursor or highlight, and the second element will be inserted after. For example, this is the default link value: ["[", "](http://)"]. lineWrapping: If set to false, disable line wrapping. Defaults to true. minHeight: Sets the minimum height for the composition area, before it starts auto-growing. Should be a string containing a valid CSS value like "500px". Defaults to "300px". onToggleFullScreen: A function that gets called when the editor’s full screen mode is toggled. The function will be passed a boolean as parameter, true when the editor is currently going into full screen mode, or false. parsingConfig: Adjust settings for parsing the Markdown during editing (not previewing). allowAtxHeaderWithoutSpace: If set to true, will render headers without a space after the #. Defaults to false. strikethrough: If set to false, will not process GFM strikethrough syntax. Defaults to true. underscoresBreakWords: If set to true, let underscores be a delimiter for separating words. Defaults to false. placeholder: If set, displays a custom placeholder message. previewRender: Custom function for parsing the plaintext Markdown and returning HTML. Used when user previews. promptURLs: If set to true, a JS alert window appears asking for the link or image URL. Defaults to false. promptTexts: Customize the text used to prompt for URLs. image: The text to use when prompting for an image’s URL. Defaults to URL of the image:. link: The text to use when prompting for a link’s URL. Defaults to URL for the link:. renderingConfig: Adjust settings for parsing the Markdown during previewing (not editing). hljs: An injectible instance of highlight.js. If you don’t want to rely on the global namespace (window.hljs), you can provide an instance here. Defaults to undefined. markedOptions: Set the internal Markdown renderer’s options. Other renderingConfig options will take precedence. singleLineBreaks: If set to false, disable parsing GFM single line breaks. Defaults to true. shortcuts: Keyboard shortcuts associated with this instance. Defaults to the array of shortcuts. showIcons: An array of icon names to show. Can be used to show specific icons hidden by default without completely customizing the toolbar. spellChecker: If set to false, disable the spell checker. Defaults to true. status: If set to false, hide the status bar. Defaults to the array of built-in status bar items. Optionally, you can set an array of status bar items to include, and in what order. You can even define your own custom status bar items. styleSelectedText: If set to false, remove the CodeMirror-selectedtext class from selected lines. Defaults to true. syncSideBySidePreviewScroll: If set to false, disable syncing scroll in side by side mode. Defaults to true. tabSize: If set, customize the tab size. Defaults to 2.
theme: Override the theme. Defaults to easymde. toolbar: If set to false, hide the toolbar. Defaults to the array of icons. toolbarTips: If set to false, disable toolbar button tips. Defaults to true. Below are the built-in toolbar icons (only some of which are enabled by default), which can be reorganized however you like. “Name” is the name of the icon, referenced in the JS. “Action” is either a function or a URL to open. “Class” is the class given to the icon. “Tooltip” is the small tooltip that appears via the title="" attribute. Note that shortcut hints are added automatically and reflect the specified action if it has a key bind assigned to it (i.e. with the value of action set to bold and that of tooltip set to Bold, the final text the user will see would be “Bold (Ctrl-B)”). Additionally, you can add a separator between any icons by adding "|" to the toolbar array. Customize the toolbar using the toolbar option. Shortcuts are automatically converted between platforms. If you define a shortcut as “Cmd-B”, on PC that shortcut will be changed to “Ctrl-B”. Conversely, a shortcut defined as “Ctrl-B” will become “Cmd-B” for Mac users. The list of actions that can be bound is the same as the list of built-in actions available for toolbar buttons. You can revert to the initial text area by calling the toTextArea method. Note that this clears up the autosave (if enabled) associated with it. The text area will retain any text from the destroyed EasyMDE instance. The following self-explanatory methods may be of use while developing with EasyMDE. EasyMDE is a continuation of SimpleMDE. SimpleMDE began as an improvement of lepture’s Editor project, but has now taken on an identity of its own. It is bundled with CodeMirror and depends on Font Awesome. CodeMirror is the backbone of the project and parses much of the Markdown syntax as it’s being written. 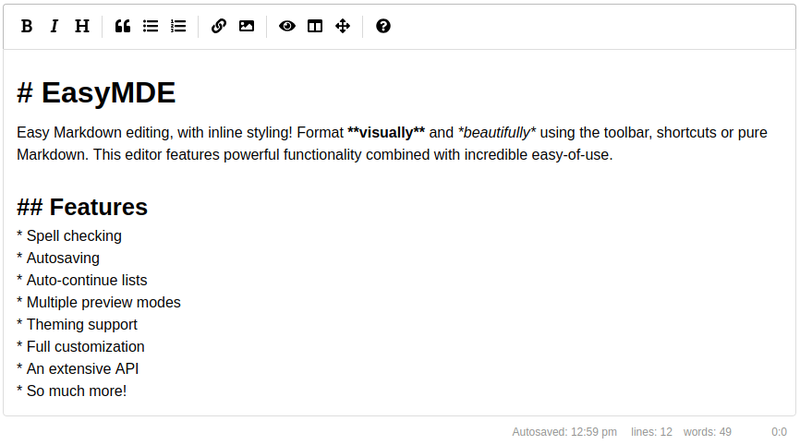 This allows us to add styles to the Markdown that’s being written. Additionally, a toolbar and status bar have been added to the top and bottom, respectively. Previews are rendered by Marked using GFM. I originally made this fork to implement FontAwesome 5 compatibility into SimpleMDE. When that was done I submitted a pull request, which has not been accepted yet. This, and the project being inactive since May 2017, triggered me to make more changes and try to put new life into the project. My intention is to continue development on this project, improving it and keeping it alive. Copy-paste those files to your code base, and you are done. Want to contribute to EasyMDE? Thank you! We have a contribution guide just for you! This project is released under the MIT License. Copyright © 2015 Sparksuite, Inc. Copyright © 2017 Jeroen Akkerman.